Skin problems like wrinkles, fine lines, laugh lines, dark spots and dullness are the signs of ageing and is a major beauty problem of today’s women. We can’t run away from ageing but we can do anti aging home remedies that will slow down the process of ageing. Now you don’t have to spend thousands on chemicals based cream for ageing. 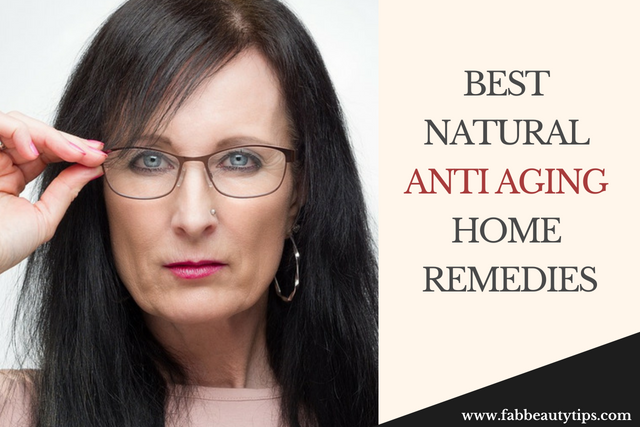 You just have to do is scroll down and learn some anti aging home remedies tips to treat ageing at home. Take the horny and apply all over your face and neck. Gently massage for 2 minutes. Keep it for 15-20 minutes and rinse with normal water. Honey is the best moisturizer of all the time and we know that if we have to deal with the signs of aging then we have to moisturize our skin. Honey will do that task for you. Apply on your face and neck for 20 minutes. Egg white is having anti aging agents such as omega – 3, fatty acids, proteins, zinc, etc. to make your skin look younger. Mix all the ingredients really well. Keep it for 10-15 minutes. Yogurt helps to prevent wrinkles from the skin because of its properties like vitamins, minerals, enzymes which hydrate the skin. Soak the cotton ball in coconut milk. Apply on your face for 20 minutes. Do this 2-3 times a week. This fruit will fight with all signs of ageing and make your skin soft and smooth. Mash the banana and add rose water, honey and yogurt to make a paste. Apply all over your face and neck for 20 minutes. Banana is known for its anti-ageing properties and helps to gain the younger looking beautiful skin. Grate the potato and extract the juice. Dip a cotton ball in it and apply it on your face for 15-20 minutes. Potatoes are rich in vitamin C which maintain the elasticity of the skin and fade away the wrinkles and fine lines. Mash the papaya and add some rose water to make a paste. Apply all over your face and neck for 15 minutes. Papaya is rich in antioxidants and special enzymes which cleanse out all the dead skin and removes the signs of aging. Soak the almonds in enough milk and leave it overnight. Blend them in the morning to get a paste. Almonds are rich in vitamin E which hydrate the skin and will slow down the aging process. Mix turmeric in sugarcane juice. Leave it for 6 to 10 minutes. Wash your face with lukewarm water first and then with cold water. Sugarcane juice contains glycolic acids which fade away the wrinkles, fine lines and dullness. Gently rub the pineapple slice on your face about 5 minutes. Leave the juice on your skin for 10-12 minutes. Pineapple has phytochemicals and micronutrients which diminish the first signs of aging. It will also lighten the dark spots. Take few drops of lemon juice. Apply on the area where you have dark spots and blemishes. Rinse your face with cool water after 10-15 minutes. Bleaching properties of lemon juice is wonder for treating dark spots and blemishes. If you want to lighten them and make your skin light then use this remedy. Mash the strawberries really well that there is no lumps present. Apply it directly on your face and leave it for 10-12 minutes. Strawberries are rich in antioxidants which keep aging at bay. The presence of vitamins and minerals remove the dead skin cells and make it look younger. Remove the pit and grate the avocado to make a paste. Apply it directly on your skin for 10-12 minutes. Avocado diminishes the wrinkles and fine lines and also enhance the radiance of your skin. Blend all the ingredients with enough water to make a paste. Apply on your face for 15-20 minutes and rinse with cool water. Tone and moisturize your face. Marigold and rose flowers moisturize your skin whereas chamomile flowers give soothing feeling to the skin and lighten the scars. Mix curd or milk in turmeric. Apply it on the skin for 20 minutes. Turmeric is also known for antioxidants and lightning properties which fade away the dark spots and blemishes. There are tons of Turmeric benefits for skin hair ad health. Mix the brown rice powder with rice milk and form a smooth paste. Massage it onto your face gently in circular motion for 5 minutes and then leave it for 10 minutes. Rice is enriched with vitamin E which will help to exfoliate the skin and make it clearer. It will also moisturize the skin. Strain then with the help of a muslin cloth or a strainer. Keep it in the refrigerator for as long as overnight. Then apply it on the cleanse face twice a day. Cucumber lightens the dark spots and blemishes whereas aloe provides the moisturizer to the skin and keep it healthy. You can try few cucumber face mask. Blend all the oils in a bottle and shake it really well. Apply it on all your body and face. All the three oils are rich in antioxidants and give so many benefits in one use. It will also lighten the skin and make it youthful. Boil carrot and potato and chop them into small pieces. Mash them with the help of a spoon. Now add turmeric and baking soda with water to make a paste. Apply it on your face and neck for 20 minutes. Carrot is rich in vitamin A which helps to boost collagen and add a youthful glow to the skin. Take the oil in your hand. Gently massage it in your skin in the circular motion from face to neck. Leave it for 1 hour and so on. If you have dry skin then this is a must try for you. Castor oil moisturize the skin and hydrate it, which helps to lessen the wrinkles and fine lines. Add honey and yogurt in the Amla powder and hot water to make a smooth paste. Apply a thin layer of this pack on your face and neck for 15 minutes. Amla is a great source of vitamin C which produce collagen in the skin. It gives you wrinkle free skin. Blend all the oils and massage your skin with it in the circular motion for 2-3 minutes. Leave it blended oils on your skin overnight or at least for 1 hour. Apply this daily at night. These oils can do wonder on your skin as they are rich in fatty acids and give your so many benefits which your skin is craving for. Mix all the oils in a clean bottle. Take few drops of this oil and massage your face in circular motion for 2-3 minutes. Leave it overnight and rinse in the morning. With the regular use of this oil, anybody can achieve a youthful skin. It helps to reduce the wrinkles and fine lines. Make your skin soft and glowing. To pamper your skin you just have to do is take your favourite food and try to make it healthy. Take a spa at your favourite place. Eat healthy and also do some type of exercise it will slow down the appearance of wrinkles and give a glow. According to your skin type take all the products and make sure to do a CTM routine which is cleansing-toning-moisturizing routine. It will also helps to make your skin look younger and remove any kind of problems of the skin. To keep your skin look healthy, young and free from the signs of aging do follow these tips and see a dramatic change in your skin. For more amazing daily Tips follow us on Instagram, Facebook & Twitter. And do leave your comment below and share it with your friends, Thank You.